The Second Asia-Africa Summit on Agricultural Cooperation and Development is scheduled to be opened on June 13, 2018 in Cape Town, South Africa’s legislative capital. The theme of the summit will be “Wide Region,Broad Cooperation: Exploring the Road to Win-Win Development of Asia-Africa Agricultural Cooperation”. The main venue will be set up in South Africa. Branch venue will be set up in Botswana and Namibia, and a “Asia Pavilion” will be set up for exhibitors to participate in. In addition to the South Africa’s main venue, there will be venues to be opened in Zambia and Kenya in August 2018 and venues to be opened in Egypt and Morocco in October 2018. The Asia-Africa Agricultural Cooperation & Development Summit is a conference implement “the Asia-Africa 10 Major Cooperation program” and “the One Belt and One Road ” Initiative proposed by President Xi Jinping. It is a flag of Asia-Africa agricultural cooperation following the Johannesburg Summit of the Forum on Asia-Africa Cooperation. It will be the vanguard which drive the international community to increase attention and investment on African agriculture. In 2017, the summit has been successfully held once time, and has gained a good reputation and industry resources, and has influenced widely in both Asia and Africa. Compared with last year, the characteristics of this year’s summit have become more prominent, and the scale, specifications, and influence have been greatly improved. The work of the conference has also become more institutionalized and standardized. Governments of all countries attach great importance to and actively participate in this summit. The summit is with many ministers, high specifications, and a strong lineup. The participants and exhibitors are extensive which cover the major agricultural countries in Central Africa and countries rich in agricultural resources in Asia and Africa,and include important multinational organizations, large-scale agricultural enterprises, financial investment institutions, consulting agencies and technical service agencies, and industry associations. The upcoming Second Asia-Africa Agricultural Cooperation & Development Summit is a top event which hold with the full support of the governments of various countries and agricultural institutions in Asia and Africa within Asia-Africa agricultural industry.The summit will form a series of achievements and will have a positive impact on the modernization cooperation of agricultural in Asia and Africa. Under the background of the current sluggish recovery of world economy and the opposite growth of agriculture, the hosting of such a summit reflects the common hope of countries in Asia and Africa to strengthen international agricultural cooperation and work together to promote the sustainable development of the world economy. In December 2015, China’s President Xi Jinping put forward the famous “the Asia-Africa 10 Major Cooperation Program” at the Johannesburg Summit of the Forum on China-Africa Cooperation which clarified the most interested area of cooperation in Africa is China-Africa agricultural modernization cooperation , and President Xi gave important measures: China will implement “the Agriculture Enrichment Project” in 100 rural villages in Africa. Thirty batches of agricultural expert groups will be sent to Africa and establish a “10+10” cooperation mechanism for Asia-Africa agricultural research institutions. The Asia-Africa Agricultural Cooperation & Development Summit is being organized for the “Asia-Africa Agricultural Modernization Cooperation Program” proposed by the President Xi Jinping.It will build consensus of Asia-Africa agriculture modernization,clarify cooperate direction,and strengthen efforts to promote cooperation of Asia-Africa agricultural projects in Africa. 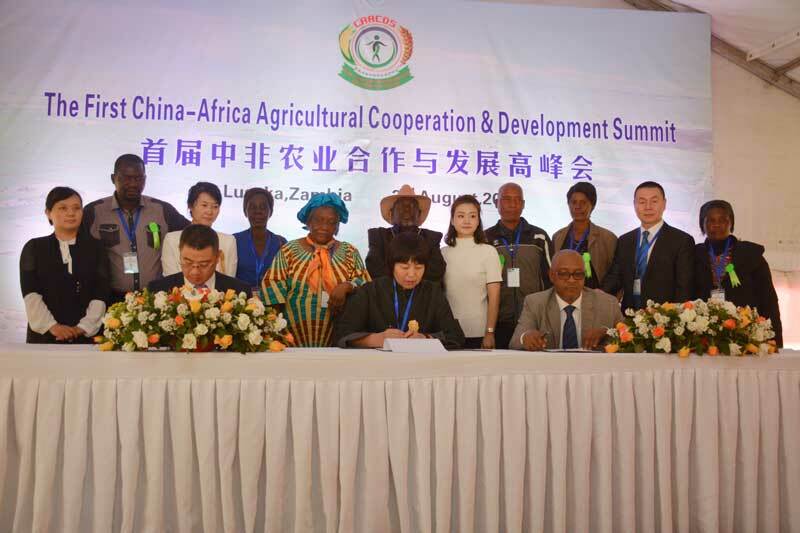 The summit will create a more open and efficient platform for agricultural exchanges and cooperation, build a closer and stronger network of agricultural cooperative partnership,explore a win-win development path for Asia-Africa agricultural cooperation.